In 2005, almost twenty years after his first visit to the Solomon Islands, Norwegian Professor Edvard Hviding published an unprecedented work: Reef and Rainforest: An Environmental Encyclopedia of the Marovo Lagoon. First arriving in Marovo in 1986, Hviding is a dedicated pedagogue, and ensured his work was not only available in the indigenous Marovo language, but that it aligned with the national curriculum, and came complete with teachers' guides and lesson plans. 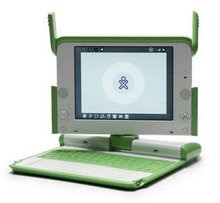 Now the OLPC XO laptops in the region are being used to bring a new dimension to this incredible resource. 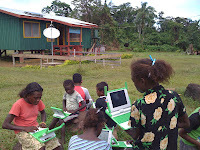 Solomon Islands Government are working with UNESCO to enable the kids of Marovo to use their XO laptops to access and update the encyclopedia via a wiki platform. The project is unique in its approach in the Pacific: making an exceptional resource not just available to remote rural schools but open to their contributions via the XO and the Wiki, accessed through VSAT internet access. "The project demonstrates how technology can be used in poor rural communities to foster and protect indigenous knowledge as a living and dynamic resource owned by the communities themselves," says ICT for education expert, David Leeming, who is managing the project. Mr Leeming cites the project as an effective use of Open Educational Resources (OER), an approach which he says is suitable for boosting the learning systems of poor and disadvantaged communities right across the Pacific. "This can work wherever there is a demand for quality education that reinforces vernacular languages and local content." Find out more about the Marovo Reef and Rainforest Wiki Project here.